The WEMPE REGATTA Series consists of extraordinarily elegant marine instruments manufactured in Germany. The porthole clock is equipped with a quartz battery facility. The available products of the series are barometers, comfortmeters, and thermometer/hygrometer combinations to measure temperature and relative humidity. 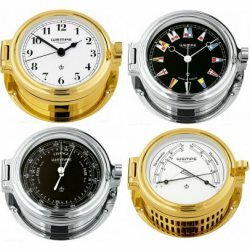 All WEMPE REGATTA instruments are available in two designs: A golden version with a white clock face and a chrome-plated version with a black clock face. The golden porthole ship clock can be ordered with either Roman or Arabic numerals. we also offer this instrument with a flag-themed clock face (designed by CORUM) as a particularly eye-catching quartz clock. The instruments of the WEMPE REGATTA Series have a diameter of 140mm with a 100mm clock face. They all stand for the company's quality craftsmanship and are valued and appreciated by ship-owners all over the world.